For those of us who bird hunt, awaiting opening day of the hunting season is not unlike the anticipation of a kid waiting for Christmas morning, except it’s visions of covey rises dancing in our heads. Even with this being my eleventh season of bird hunting, this year was no different. I seriously had a hard time sleeping Sunday night because I was so excited to hunt blue and ruffed grouse! I awoke Monday to a chilly morning (especially for Labor Day), but knew that cool weather is good for bird dogs. Instead of being on the mountain at daybreak, I decided to take my time and get there well after sunrise. My hopes were that the delay would give the blues a chance to come off their piney roosts and lay down some scent for the dogs. 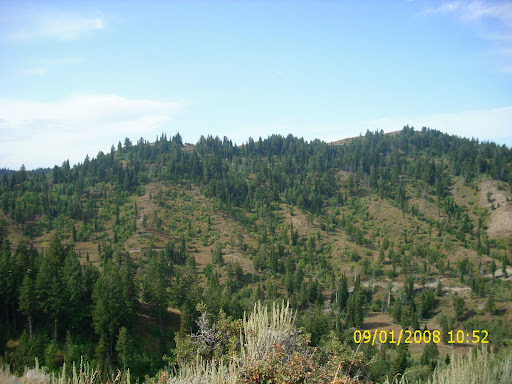 Our first destination was a covert, I call, “Grouse Ridge” for obvious reasons. Despite the splendid success I have had here in the past, I found no birds or sign in the usual places. 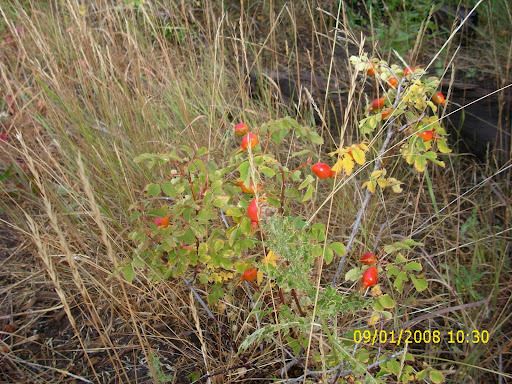 But I noted that the berry bushes are loaded, their fruit is plump, and it is still unseasonably green, even at lower elevations. Perhaps the birds have not began their upward migration because of the abundant food and cover at lower elevations. Check out these huge rose hips! After watering the dogs, we moved on to a new covert I named, “The Knife’s Edge” because of the narrow, razor-like ridge that predominates this sweet spot. Down in the valley is a small spring that makes this area even more appealing for wildlife. Although I did not find any birds, I will definitely return to this birdy-looking place. Sunny and Dusty living on the Knife’s Edge. For our last stop of the day, I pointed my Subaru east towards a covert I have dubbed, “Grouse Springs” because of a natural spring that occurs at the bottom of a bird-filled draw. The runner-up name for this covert was “Viet-Freakin-Nam” because of how thick and impenetrable some areas are in the jungle-like draws. Grouse Springs won out only because I seem to always find birds around the springs. This covert is a series of sagebrush benches intersected by numerous draws filled with quaking aspens. 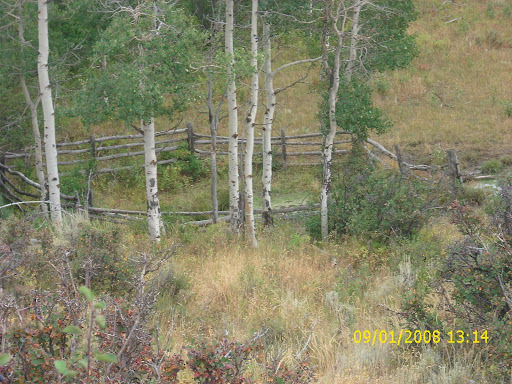 This fence keeps the cows out of the Grouse Springs (sometimes). 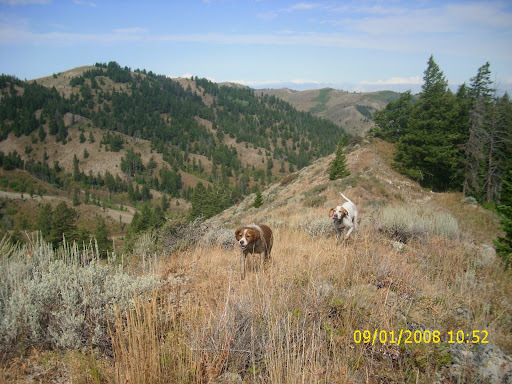 Upon arrival, the dogs and I hunted through the first draw without success. So we headed up the sagebrush bench to the north. I say “sagebrush bench,” but upon closer inspection, the benches also hold plenty of bitter brush and service berry bushes. Usually the service berries at this time of year are shriveled up like raisins, but this year they are juicy like grapes. As we worked our way up the bench, a big blue flushed unexpectedly right at my feet and scared the dickens out of me. Fortunately, I recovered in time to make good on a crossing, left to right shot. Sunny girl, my French Brittany, made a quick retrieve of my first bird of the year. When I later cleaned the bird at home, I found its crop chuck full of the purple service berries. My first blue of the year. 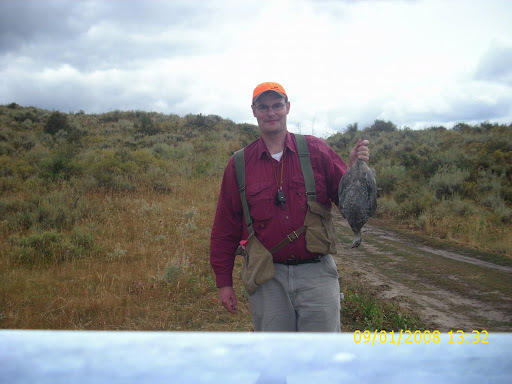 With a blue in the bag, I decided to try for a ruffie in pursuit of my goal to take the Idaho Grouse Grandslam (see “Quit Grousing Around” below) this year. For that reason, I decided to make for the quakies. Sure enough, we soon found a tiny ruffed grouse that flew up into a nearby tree. Given its size and behavior, it had to be a bird of the year. I approached it and yelled to make it fly. When it flushed, I raised the gun, pointed, and pulled the trigger. Plink. The shotgun shell was a dud! Believe it or not, I was happy for the lucky, clueless bird. In a long day of hunting, we moved a total of two birds and harvested only one. Some might think that is a crummy day, but not me. It was a fulfilling and memorable hunt in every way: I got to spend time with my dogs in the uplands, my stress was relieved, my spirit was revitalized, and my attitude was greatly improved. The birds are just a bonus. Mission accomplished! Mission Accomplished! (Notice the matted burrs in Sunny’s fur). 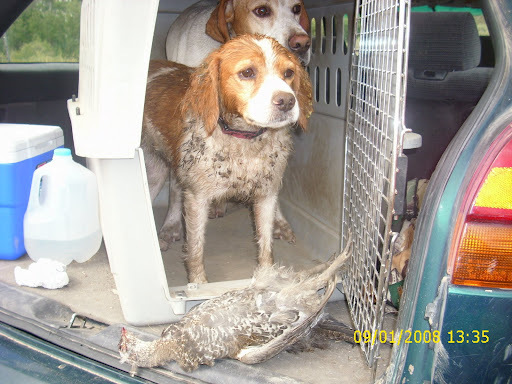 Next Post >Bird Dogs, Blue Grouse, and Grouse Bums! What are you feedin’ those birds over there?Great pixs…thanks!